Love for Let's Geddit! ~ No Limits on Learning! Teachers prepare a lesson, topics, and questions (mostly in advance) and students "check in" and provide answers and self-assessments as the lessons progresses. During the lesson, students can change their assessment about the topic and material, and teachers can monitor the class' progress. 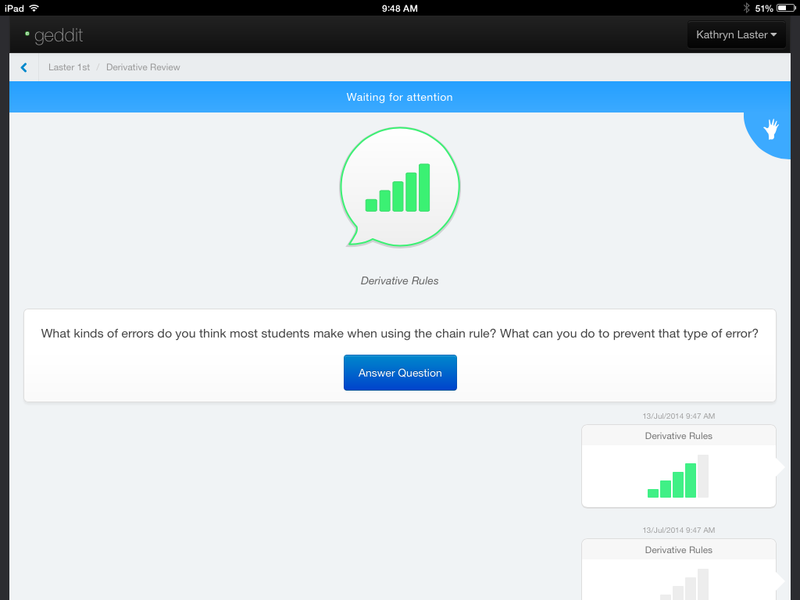 Once you start the lesson, you ask a question and give students an opportunity to check-in. I created this lesson in May, but I didn't get a chance to use it with my classes, so I used myself as a student to get these screen shots. 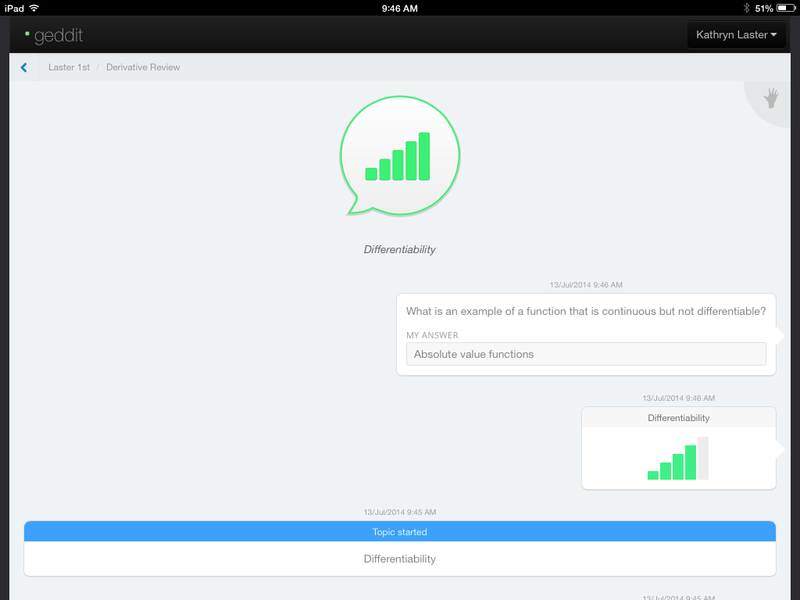 I used my iPad and the geddit app for students to demonstrate the student responses. 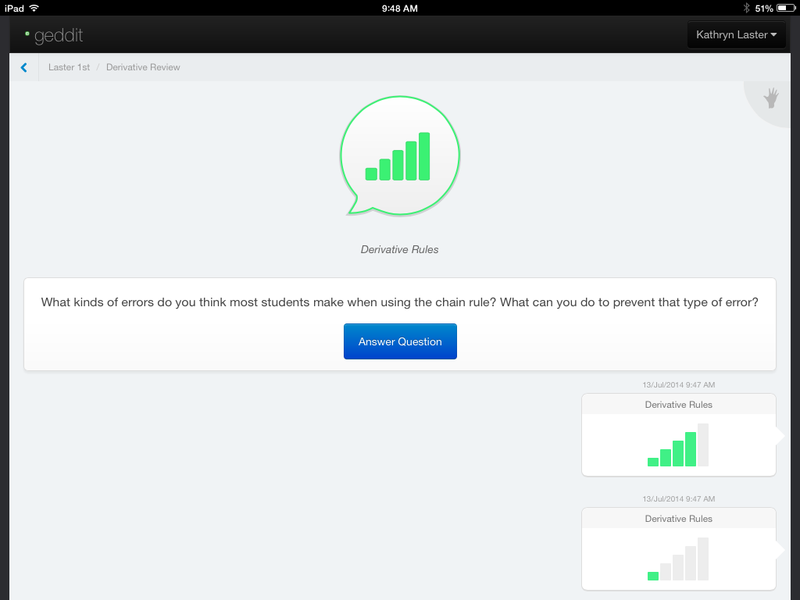 During class, you can quickly assess how your students are doing, based on their self-assessments. After the lesson ends, you get all kinds of reports and data of all of the students' responses, including how many times students checked-in, who specifically might be struggling, and their questions, responses, and any comments to you. It was also easy to upload pictures to use as part of the lesson or a "quiz." For this image, I used my iPad and a note-taking app, took a screen shot, and opened geddit on my iPad to upload the image. Teacher considerations: as I mentioned earlier, this resource requires quite a bit of pre-planning and work on your end, but I want to prepare my questions in advance, so that's good! (You also have the option of a "quick question," so it doesn't all have to be advanced work.) You now have the option of stopping and resuming a lesson, so you can prepare work that spans several days to get ongoing assessments from your students, so that's a plus. One other issue: I like to write notes using my iPad, but I needed to see the student feedback, so I needed two devices to make this work for me. Since I am a floater teacher, it was a bit of a pain to lug around an extra device, and I had to figure out in each room how to set up my space to be able to see the students' responses as we moved through the lesson. Another good thing: taking time to stop and assess was a great reminder to "chunk" information and to slow down to allow students time to process. I think I'll have a student volunteer be my geddit assistant--someone who stops me and reminds the class to check-in. Classroom management considerations: our school is BYOD, and I have a few iPads to use during class, but this resource is definitely an individual student response system. With some of the other apps, I allow students to work in pairs or with tables, but for geddit, I wanted individual assessments, so I wanted everyone to have a device. Students must log in and join your class, so there are always the "I can't remember my password" issues, plus the "I can't get on the network" kind of days. Because I expected students to have logins to several websites and apps, I plan to have them create some kind of reminder (a Google doc, perhaps?) with all of their passwords listed. I started using geddit prior to spring break, and students were always itching to be on their device. I think for next year, I will have the stipulation that if I see your device out, I must see multiple check-ins throughout the class. If you're not checking in (and using your device for educational purposes, such as formative assessments) I'll pick up your device! I think if I start using geddit at the beginning of the year, and if we work out all of the classroom management issues, this resource will be a terrific addition for my class and for my quest for ongoing formative assessments. The developers continue to update the program, and they are quick to respond to any questions. The students found the app easy to use, and once they got over their silliness of comments and of virtually raising their hands, they appreciated the feedback. 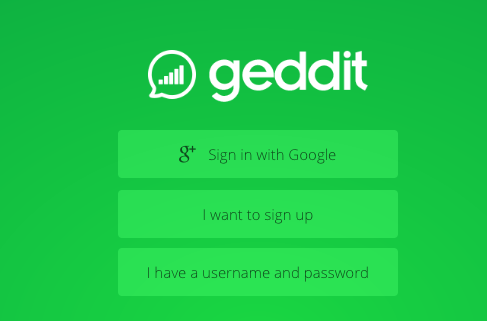 Has anyone else used geddit? Any other suggestions for class management and questioning issues? Features that you love?